Ian Stannard (Sky) won a two-up sprint with Greg Van Avermaet (BMC Racing) to take the Omloop Het Nieuwsblad on Saturday. The two were alone at the finale of the sodden 198km race, the kickoff to cobble season for 2014. Stannard and Van Avermaet had just enough advantage over a three-man pursuit — Niki Terpstra (Omega Pharma-Quick Step) and Sep Vanmarcke (Belkin), with Edvald Boasson Hagen (Sky) along for the ride — for a bit of cat-and-mouse in the final soggy kilometer. Van Avermaet took the front early, but Stannard opened the sprint from well out, coming around the BMC man’s left side with 250 meters to go. After being caught off guard, the Belgian nearly overhauled him, but simply ran out of road. It was Stannard taking the win by a wheel, with teammate Boasson Hagen proving fastest of the pursuit to join his teammate on the podium in third. 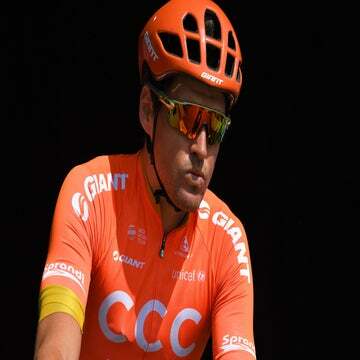 Van Avermaet admitted he was caught off guard and said the foul weather “played tricks” on him. Boasson Hagen, who himself had been off the front with Terpstra coming out of the final stretch of cobbles, said the plan was always to get Stannard on the top step. “Stannard was the main guy for today,” he said. “[In the final] I didn’t know if Stannard knew that I was behind, but that didn’t matter because he was the main guy and I was in a good position. I obviously knew he was in front, so I didn’t have to ride against him. • Taylor Phinney (BMC) had a top-10 finish, crossing seventh. • Teammate Thor Hushovd, who won here in 2009, was not so fortunate — he crashed out of this year’s race with 92km to go. “There was braking in the front and one CCC Polsat guy didn’t have time to brake and went straight into me,” Hushovd said. “I don’t think anything is broken; that’s a good thing.” X-rays later confirmed Hushovd’s diagnosis. Defending champion Luca Paolini (Katusha) likewise went down in a big pileup, but a broken saddle appeared to be the worst of it for him. • Pre-race favorite Tom Boonen (Quick Step) finished 33rd, nearly four minutes down. Like Van Avermaet, sport director Wilfried Peeters blamed the weather. “It was cold and wet while Tom just raced under the heat of Qatar and Oman. The temperature difference can explain some things,” he said.